Varus deformity of the knee is one of the most common deformities seen at the time of total knee arthroplasty. When a fixed deformity is present, the pathoanatomy usually involves erosion of medial tibial bone stock with medial tibial osteophyte formation, and contractures of the medial collateral ligament (MCL), pos-teromedial capsule, pes anserinus, and semimembranosus muscle (Fig. 3.1). Elongation of the lateral collateral ligament is a late event. A flexion contracture may coexist, which is manifested by contractures of both posterior capsule and posterior cruciate ligament. The ideal alignment is achieved through soft tissue releases aimed at balancing the collateral ligaments, and by placing the components in the correct orientation. If the proper alignment is not achieved, or if the ligaments are inadequately balanced, the components will be overloaded medially and subjected to excessive stresses, which may result in the eventual failure of the arthro-plasty via either component loosening or accelerated wear. Intra-operatively, it is imperative to reassess each step of the soft tissue release so as not to overcorrect the deformity and create valgus instability. Figure 3.1. Genu varum usually caused by medial tibial bone loss and contractures of the medial soft tissue structures. A careful physical examination of the knee should assess the range of motion, flexion contracture, degree of deformity, ligamentous stability, and muscle strength. Anterior cruciate ligament deficiency is a common finding in a degenerative knee, but it is not a surgical dilemma in total knee arthroplasty. In contrast, deficiency of the posterior cruciate ligament (PCL) is much less common. A more likely scenario is the situation of a fixed-varus deformity with a flexion contracture, which requires resection of the PCL for complete correction of the limb alignment and flexion contracture. For these cases, a PCL-substituting design should be utilized. In those cases with severe contracture requiring extensive soft tissue release, a constrained condylar implant should be available. This is more often the case for severe genu valgum and not for fixed-varus deformities. A detailed assessment of preoperative radiographs should be made for accurate preoperative assessment. This includes weight-bearing anteroposterior (AP), lateral, and tangential patella radi ographs, as well as a full length standing AP radiograph. Patella tracking should be noted on the tangential patella view, because this may suggest preoperatively the need for lateral retinacular release. Bony defects should also be noted, because prosthetic augmentation or bone grafting may be required. The mechanical axis, degree of deformity, and femoral valgus should also be noted. if an intramedullary instrumentation system is utilized in which the valgus orientation of the distal femoral cut can be adjusted, then knowledge of the deformity and anatomic femoral valgus can allow one to slightly increase the valgus orientation of the distal femoral cut. This would then facilitate ligamentous balancing in severe fixed deformities. The anterior midline approach, with a medial parapatellar arthro-tomy, is preferred because this allows for adequate exposure in most knees. it is also extensile in nature and can easily be converted into a quadriceps snip2,3 or V-Y turndown4 when warranted by knees that are difficult to expose, such as post-osteotomy or in patella infera. An anterior incision also allows for exposure of both medial and lateral supporting structures, and obviates the need for additional incisions. The anterior longitudinal skin incision is carefully placed medial to the tibial tubercle to avoid a tender scar postoperatively. Following this, a medial parapatellar arthrotomy is carried out through a straight incision extending over the medial one-third of the patella and is continued onto the tibia 1 cm medial to the tibial tubercle. The quadriceps expansion is peeled off of the anterior patella via sharp dissection. The synovium is divided in line with the arthrotomy, and the anterior horn of the medial meniscus is divided. Patellofemoral ligaments are released, and the patella is everted and dislocated laterally, while the knee is flexed up. The anterior cruciate ligament, if present, should then be divided, as should the anterior horn of the lateral meniscus, which will facilitate eversion of the extensor mechanism. 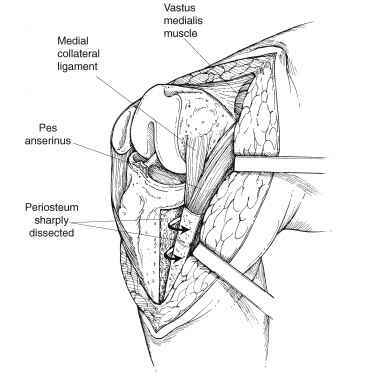 To avoid avulsion of the tibial tubercle, the patellar tendon should be dissected subperiosteally with a cuff of periosteum to the crest of the tibial tubercle. As much as one-third of the tubercle may be exposed, but this is rarely necessary. 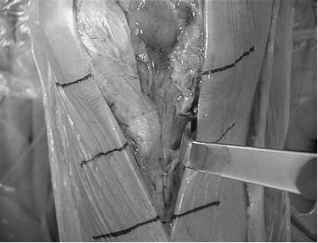 Lastly, the fat pad and synovium can be resected to help expose the lateral tibial plateau. This exposure is the most versatile and utilitarian of all the exposures for total knee arthroplasty. Figure 3.2. 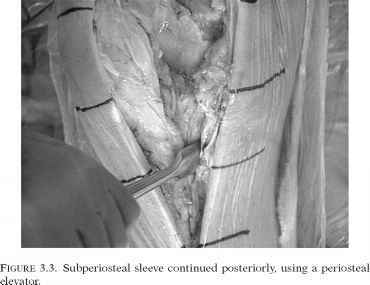 Subperiosteal sleeve sharply dissected from proximal anteromedial tibia, including superficial and deep MCL, along with the pes anser-inus tendons, if needed. 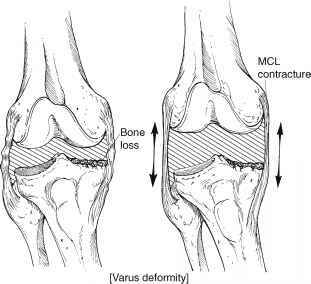 MCL (Fig. 3.4). Placement of this retractor allows for traction to be placed on the medial structures, thereby facilitating subperiosteal dissection. With the knee in extension, a flat three-fourths inch osteotome is passed distally and deep to the superficical MCL (Fig. 3.5). A complete release requires that the osteotome be passed as much as 6 inches distal to the medial tibial plateau. Depending on the degree of release required, the pes anserinus can also be completely detached, or left partially attached as the osteotome elevates the MCL immediately posterior to the most anterior attachment of the pes tendons. Similarly, the osteotome can be used to release the deep attachment of the soleus muscle from the posteromedial tibial metadiaphysis. Figure 3.4. 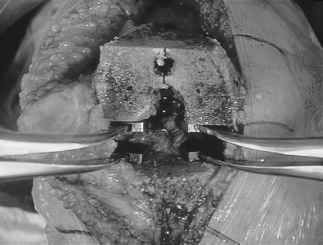 Hohmann retractor placed deep to subperiosteal sleeve places tension on structures, permitting further dissection. Figure 3.5. Osteotome inserted deep to periosteal flap or MCL, used to sub-periosteally strip medial supporting structures from proximal tibia, while maintaining a continuous soft tissue sleeve. (Fig. 3.6). In this way, the posteromedial tibia can be safely exposed to the midline. At this point, the tibia appears skeletonized (Fig. 3.7). Medial tibial osteophytes may serve to tighten the medial side, because the MCL is draped over the osteophytes. Thus, resection of the medial tibial osteophytes is the final step in releasing a fixed-varus knee. It is often useful to wait until a trial tibial component has been inserted before resecting the medial tibial osteophyte. In that way, one can use the trial component as a template and ensure that excessive bone is not excised. Over release of the medial structures in a knee with even a mild deformity is usually not encountered, because this technique ensures that the MCL is not transected, but rather is maintained as a continuous sheet of tissue confluent with the periosteum. The extent of release can be monitored by placing the knee into full extension and exerting a valgus force. Alternatively, lamina spreaders can be gently inserted into the femorotibial articulation (Fig. 3.8) and the alignment judged with a plumb line. Figure 3.6. Semimembranosus insertion sharply dissected with tibia externally rotated. FIGURE 3.7. Skeletonized appearance of tibia after semimembranosus released. FIGURE 3.8. Laminar spreaders are useful in monitoring soft tissue balance and ligament releases. FIGURE 3.9. Anteroposterior femoral cutting guide is aligned along the epicondylar axis and incorporates principles of anterior and posterior referencing. is taken to position this cutting guide so that the posterior condyles are not over- nor underresected, and that the femur is not notched anteriorly. The remnants of the cruciate ligaments and menisci are then resected, as are the intercondylar osteophytes. Meticulous attention is then turned toward resection of posterior osteophytes because they may limit flexion. A curved three-fourths inch osteotome is used to resect this bone, as well as to perform a release of the posterior capsule off of the distal femur, when indicated (Fig. 3.10). This maneuver is particularly useful in correcting flexion contractures, but is also useful for releasing the medial gastrocne-mius in knees with flexion contractures and fixed-varus deformities. The tibial cut is then made utilizing an extramedullary guide adjusted to be perpendicular to the longitudinal axis of the tibial diaphysis, to match the posterior slope of the tibial plateau, and to resect approximately 1 cm of bone from the normal lateral tibial plateau. one should not resect the proximal tibia so as to eliminate any medial tibial bone defect that may exist, because this may be excessive. FIGURE 3.10. Curved osteotomes are used to remove posterior condylar osteophytes and recreate the posterior recess. Figure 3.11. The flexion and extension gaps should be equal and rectangular in shape. The ligament balancing, as well as the overall limb alignment, is then assessed with the use of spacer blocks in flexion and extension. When performed in this manner, with soft tissue release preceding bony resection, the flexion and extension gaps are rectangular and are usually equal in magnitude (Fig. 3.11). Occasionally, the extension gap may be tighter than the flexion gap, necessitating re-cutting of the distal femur to equalize the flexion-extension gaps. Alignment of the femoral cutting block with the epicondylar axis6,7 is a more precise way of ensuring that the femoral component is externally rotated. This also helps to balance the collateral ligaments in flexion. Excessive external rotation of the femoral component should be avoided, because this will result in an asymmetric flexion space. Additionally, internal rotation of either the tibial component or the femoral component is to be avoided, because patellar instability may result. The management of tibial bone defects is beyond the scope of this chapter. One suggestion that has been worthwhile is lateralization of the tibial component, because this may reduce the need for augmentation of a medial tibial defect. The technique described in this chapter for releasing the medial structures of the knee, balancing the ligaments, and restoring the normal alignment of the knee has proven to be successful. The survivorship data8,9,10,11 and results of clinical and radiographic follow-up studies1,12,13 have shown that this technique for medial release of fixed-varus deformities is both predictable and durable. in a long-term follow-up of total condylar knees, the most senior author (JNI) and colleagues reported on 130 TKAs.13 Of these, 63 (48%) had a varus deformity, including 23 (18%) who had a fixed-varus deformity of at least 10 degrees. At 10- to 12-years of follow-up, 88% had good to excellent results. Varus-valgus stability was maintained in all cases, except in one in which proper soft tissue balancing was not achieved, and varus instability recurred. in all, 81% had less than 5 degrees of instability to varus-valgus stress when tested in full extension. Testing collateral stability in positions other than full extension is unreliable, because the lack of conformity in the prosthesis will allow some laxity with flexion. When the soft tissues are balanced meticulously, the released medial structures are usually not over-released, but rather remain contiguous with the medial tibial periosteum. Several complications can occur from the correction of fixed-varus deformities. These include instability of the tibiofemoral or patellofemoral articulations, or avulsion of the tibial tubercle. Instability instability can occur in either extension or flexion, and can be either symmetric or asymmetric. Symmetric extension instability usually occurs from excessive resection of the distal femur, resulting in an extension gap that is inadequately filled by the compo nents. Insertion of a thicker spacer may solve this problem, whereas creating a new one in that the flexion gap may now be too tight. A better solution is to build up the distal femur with the use of modular femoral augments. Asymmetric extension instability is likely due to improper balancing of the collateral ligaments. This occurs when the contracted tight medial structures are inadequately released, or due to inadvertent division of the MCL. If the collateral ligaments cannot be balanced with soft tissue releases, or if the MCL is incompetent or transected, a constrained condylar implant may be needed. Flexion instability may be asymmetric if the femoral component is malrotated into either internal rotation or excessive external rotation. Varus release balances the knee in extension, whereas external rotation of the femoral component creates a balanced, rectangular flexion gap. We prefer to set the rotational alignment of the femoral component along the epicondylar axis6,7 to avoid excessive external rotation and internal rotation. Symmetric flexion instability may paradoxically arise from insufficient resection of the distal femur. The tight extension gap then dictates a thin spacer, which inadequately fills the flexion gap, thereby creating flexion instability. The solution here would be to resect additional distal femur by an amount dictated by the difference in the thickness of the spacers used in flexion and extension (Fig. 3.12). Downsizing may also create flexion instability because the posterior condyles are over-resected and replaced by a lesser amount of component (Fig. 3.12). In theory, a similar phenomenon may be encountered by instrumentation systems that rely on anterior referencing alone. The latest system of instruments that we use combines anterior and posterior referencing into the same guide as to minimize this dilemma. Patellar instability more typically presents a challenge following correction of a fixed-valgus knee. However, even in a varus knee, attention to proper alignment and positioning principles is of paramount importance to ensure proper patellofemoral kinematics. Figure 3.12. The effect of the bone cuts on prosthetic fit. 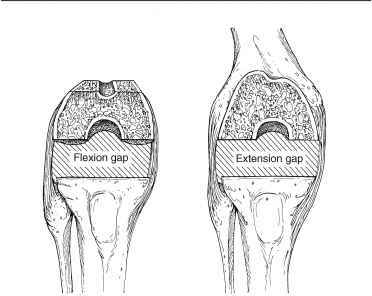 (A) Tibial resection affects both flexion and extension gaps equally. 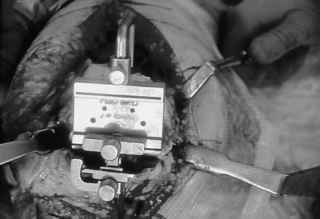 (B) Distal femoral resection affects only the extension gap. In the case of extension instability, if the knee is too tight in flexion to admit a thicker tibial component, distal femoral augmentation is needed. (C) A downsized femoral component may inadequately fill the flexion gap, creating flexion instability. Use of a thicker tibial component may not help, because the knee may be too tight in extension. The solutions are to either use a larger-sized femoral component with posterior augments, or to resect additional distal femur and insert a thicker tibial component. shift the tubial tubercle laterally, in effect worsening the Q-angle and may result in patellar instability. The tibial and femoral component should also be lateralized, and the patellar component medialized, because this will improve tracking. Avulsion of the tibial tubercle can easily occur during exposure of a stiff knee with a fixed-varus deformity. When the patella is everted and the extensor mechanism is dislocated laterally, considerable traction is exerted on the patella tendon, which risks being avulsed off of the tibial tubercle. Repairing a transverse rupture of the patellar tendon is a difficult and usually unsuccessful process, which is best avoided by meticulous technique during exposure of the knee. The medial parapatellar arthrotomy should be continued onto the tibia to a point 1 cm medial to the tibial tubercle. This allows the patellar tendon to be dissected subperiosteally off of the medial third of the tibial tubercle with a long cuff of periosteum. 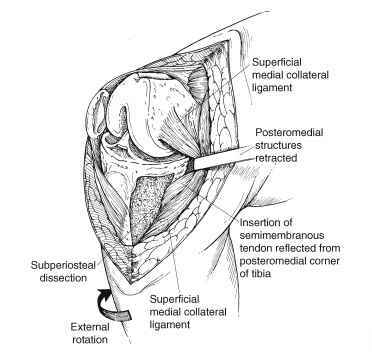 Excessive tension on the extensor mechanism may pull the patellar tendon along with this periosteal sleeve farther away from the tibial tubercle, but maintains distal continuity of the soft tissues and prevents a horizontal tear. The best method of preventing avulsion of the tibial tubercle is to avoid excessive tension on the tibial tubercle. 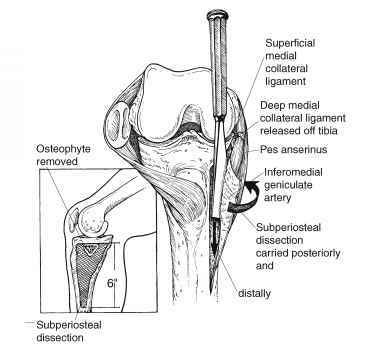 In addition to sub-periosteal dissection of a cuff of periosteum with the patellar tendon, one should use long skin incisions (8 to 10 cm proximal and distal to patella), extend the medial parapatellar arthrotomy far proximally into the quadriceps tendon, release completely the patellofemoral ligaments and excise the synovium from the lateral gutter, adjacent to the lateral tibial plateau. If after all of these measures there still exists excessive tension on the tibial tubercle, a quadriceps snip2,3,16 or V-Y quadricepsplasty4 should be performed. Clin North Am. 1989; 20:71-78. 2. Garvin KL, Scuderi GR, Insall JN. Evolution of the quadriceps snip. Clin Orthop. 1995; 321:131-137. 3. Insall JN. Surgical techniques and instrumentation in total knee arthroplasty. In: Insall JN, ed. Surgery of the Knee. 2nd ed. New York: Churchill Livingstone; 1994: 739-804. 4. Trousdale RT, Hanssen AD, Rand JA, Cahalan TD. V-Y quadricepsplasty in total knee arthroplasty. Clin Orthop. 1993; 286:48-53. 5. Stiehl JB, Komistek RD, Dennis DA, Paxson RD, Hoff WA. Fluoroscopic analysis of kinematics after posterior-cruciate-retaining knee arthro-plasty. J Bone Joint Surg. 1995; 77B:884-889. 6. Berger RA, Rubash HE, Seel MJ, Thompson WH, Crossett LS. Determining the rotational alignment of the femoral component in total knee arthroplasty using the epicondylar axis. Clin Orthop. 1993; 286:40-47. 7. Poilvache PL, Insall JN, Scuderi GR, Font-Rodriguez DE. Rotational landmarks and sizing of the distal femur in total knee arthroplasty. Clin Orthop. 1996; 331:35-46. 8. Colizza WA, Insall JN, Scuderi GR. The posterior stabilized total knee prosthesis. Assessment of polyethylene damage and osteolysis after a ten-year-minimum followup. J Bone Joint Surg. 1995; 77A:1713-1720. 9. Diduch DR, Insall JN, Scott WN, Scuderi GR, Font-Rodriguez D. Total knee replacement in young, active patients. Long-term follow-up and functional outcome. J Bone Joint Surg. 1997; 79A:575-582. 10. Scuderi GR, Insall JN, Windsor RE, Moran MC. Survivorship of cemented knee replacements. J Bone Joint Surg. 1989; 71B:798-803. 11. Stern SH, Insall JN. Posterior stabilized prosthesis. Results after follow-up of nine to twelve years. J Bone Joint Surg. 1992; 74A:980-986. 12. Insall JN, Hood JW, Flawn LB, Sullivan DJ. 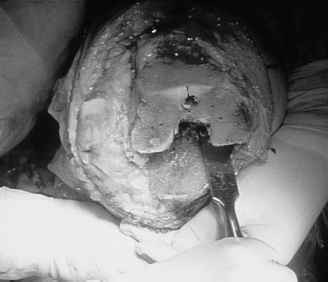 The total condylar knee prosthesis in gonarthrosis. A five- to nine-year follow-up of the first one hundred consecutive replacements. J Bone Joint Surg. 1983; 65A: 619-628. 13. Vince KG, Insall JN, Kelly MA. The total condylar prosthesis. Ten- to twelve-year results of a cemented knee replacement. J Bone Joint Surg. 1989; 71B:793-797. 14. Tenney SM, Krackow KA, Hungerford DS, Jones M. Primary total knee arthroplasty in patients with severe varus deformity. Clin Orthop. 1991; 273:19-31. 15. Scuderi G, Cuomo F, Scott WN. Lateral release and proximal realignment for patellar subluxation and dislocation. A long-term follow-up. J Bone Joint Surg. 1988; 70A:856-861. 16. Scuderi GR, Insall JN. Fixed varus and valgus deformities. In: Lotke PA, ed. Knee Arthroplasty. New York: Raven Press; 1995: 111-127. 17. Scuderi GR, Insall JN. Total knee arthroplasty. Current clinical perspectives. Clin Orthop. 1992; 276:26-32. IS PROGRESSIVE SUBPERIOSTEAL MEDIAL RELEASE IN A TKA? Can arthroplasty correct varus knee deformity? Can lateral release correct a valgus deformity? What is a medial release of the knee? What is meant by a medial release knee? What is reale the deep medial collateral ligament off the tibia during this deformity? What is extensive medial release? Is medial release for varus deformity a usual part of a knee replacement? How to match flexion and extension gap? What is VARUS NOR VALGUS INSTABILITY? What is a subperiosteal knee release? What is done during a posteromedial release to correct varus deformity of left knee? Is medial release included in a TKA? What is medial release in total knee arthroplasty?